Guess who is back? Sooookeh! Now with more fairies, magic fruit, and the boss from "Office Space"
"True Blood" is back! "True Blood" is back! Okay, technically we have to wait till June 26th to see the fourth season of Alan Ball's campy vampire Gothic with the worst fake Southern accents since James Van Der Beek told his dad he didn't "waaahnt yer liiiiife" in "Varsity Blues." But ever since HBO released the first three minutes of the premiere, I can feel the butterflies of my intense love/hatred with this show already fluttering in my stomach. In case you hate spoilers, don't read this next part: Now we know where Sookie went when Glinda the Good Witch Claudine her Fairy Godmother came and swallowed her up in a ball of light. Because remember, Sookie (who I keep wanting to write out as a Snookie, so help me God) is part fairy, and also she is mad at her boyfriend Vampire Bill, so why not just run away with a lady offering you glowing fruit, right? Anyway, Sookie gets transported to heaven/fairy land/a Greek bathhouse with very complimentary lighting, and runs into some old friends! Sookie looks a little concerned with all the Glowfruit consumption, probably because it's a little too reminiscent of Maryann the maenad and her Ecstasy raves two seasons ago. But before she can get too upset, look over there! It's Grandpa Gary Cole! He doesn't know how long he's been up in Fairytown, eating Glowfruit. This is presented like it’s a bad thing, but I don't know. There are worse things than remaining immortally young and hanging out with hot fairies all day. 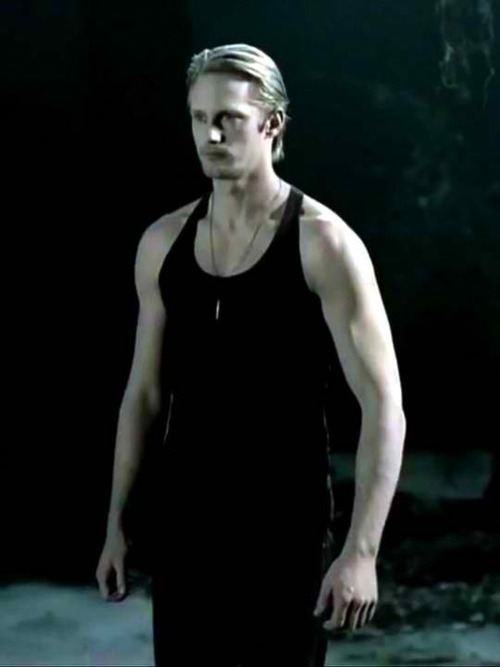 Although knowing Sookie, it won't be too long until she's running back to control-freak Bill and his nemesis/BFF/sheriff, Eric "No black tank top, no glory" Northman. What are you looking forward to loving/hating next season? Is it Alcide? Jason's new adopted meth family? The scary thought that Tara might return? Personally, I hope this season is all Jessica and Hoyt: those two kids could have a spin-off show and I'd watch it over this.